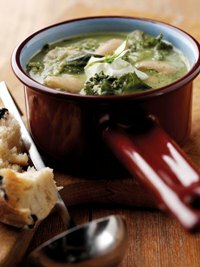 This soup is the perfect lunch time warmer for the winter months. Containing the super, super food – Kale, it’s also a great mood booster and should help combat those January/February blues due to its alkalizing properties which are said to combat inflammation that may be linked to depression. An amazingly nutritious leafy green vegetable and the best green in terms of antioxidants, it contains high amounts of beta carotene (precursor of vitamin A) and vitamin C and is also rich in minerals and high in folic acid. 1. Fry off the onion and thyme in a squirt of oil until soft. Add the garlic, butter beans and vegetable stock. 2. Cook for approximately 20 minutes until the beans are soft and mushy. 3. Fold in the kale and cook for a further 10 minutes until the kale is wilted and soft. 4. Divide the soup into two parts, blitz one portion and then mix back together with the rest of the soup. Place a spoonful of Greek yoghurt in the middle of each bowl, season to taste and serve with some warm, crusty bread. To spice the soup up a little, try adding a little pan-fried chorizo sausage to the soup before serving. This wonderfully healthy soup can be made with a wide range of vegetables. Perfect for using any leftover chicken after your roast. Chunks of creamy dolcelatte float around a deliciously fresh soup.